I have an adopted daughter and I'm very open about having more adopted children. She and her husband are from the part of the country where male children are really valued. Husband doesn't seem disturbed about their inability to have a son as a matter of fact after having the third child through CS he told her to stop. But she desperately wanted to give him a son she tried one more time. One day she came to my house to seek my opinion, she told me her husband had warned her not to give birth anymore. And he said if she so desperately wants her a son they should adopt and because she knew about my adopted daughter she came to ask for my advice. She told me she was scared about adopting a son, because in the future it might bring problems. Problems with inheritance, because they are from the part of the country where a girl child is usually not included in the will. They don't give the female children much or anything at all of her father's property. So this lady told me she's not very comfortable with somebody that is not their blood coming into the family and taking all the husband's wealth. I told her if that was how she felt then she shouldn't adopt a son. She was surprised at my response, because I'm always encouraging people that if they have love in their heart to give a child and money in their pocket(account) they should adopt. I also would have told her to work on her herself, work on her mind and also work on her female children. we should teach our children to grow up and earn their own money and not wait for inheritance money. *Tell her which truth again?Please mind your business oh. Hmmmm. Adoption is what i never not considered. I am 40years old,have 4 daughters through Normal delivery but I am considering Surrogacy or Las Las IVF and Elective CS. And Yes I need,want a Son. Since she has her fears, she should just rest it and focus on her beautiful children. Please if ya conscience na apia gi utari, flog you make you yarn her truth o.
I always dey tell my Sisis, instead of shooting off a pikin wey you open ya koro koro tohtoh collect, make you give am up for adoption. You fit carry am sef dash Rev. Sisters them. Eheee, you go be free like butterfly to dey fegharia. Ya conscience no go dey flog you at all. Which one is your truth again? The advice you gave her is the best, if that is how she feels then she has no business adopting before she start acting Nollywood movie later. You told her the truth, with such mentality, that's what she deserve. If she can not see the adopted son as her own, make she no bother abeg. I'm so going to mind my business. You have already told her the truth in her case. The only thing you can let her know is there are so called biological sons that squander their father's wealth while their siblings and mothers suffer. If herself and husband cannot forget tradition and share things equally among the children, they should not bother to adopt a son. Allow me to digress. On a normal day the worried woman should not be bothered about having only girls if they are christains and their people are majorly christains. But the majority of Nigerian christains like to read just some specific verses of the bible, and still interpret those specific parts erroneously. If not, they would have read the story of Zelophad's daughters in Num 38 and known for themselves that it is wise to include girls in wills. Instead, they hold on to what their pastor or reverend read and interpreted for them. Their two favourite laws are, a woman should not wear a man's clothing and thou shall not be yoked with an unbeliever. Trousers have been the norm for both sexes in Asia since the 1500s and gowns were the norm for the jews. How they knew that the particular garment not to be worn by women is the trouser, eludes me cos women still wear other clothing (e.g Tshirt) that men wear. Then these same christains will still admire paintings of angels wearing skirts above the knee. About not being yoked with a unbeliever in 2 Cor 6:14-28, they will never see 1 Cor 7:14, they quickly interpreted it as not marrying unbelievers but in their minds they can by foods that they will eat and also use for thanksgiving from unbelievers and also form partnerships and have business deals with unbelievers. After the same portion of the bible in the quoted verse, says be seperate from unbelievers. Another one is these christains still forbid IVF. But they don't mind accepting blood or or a vital organ from an unbeliever. Nigerian christains esp the common man or woman, should learn how to read and interpret the whole bible for themselves and know that no matter how hard they try they can never follow everything in the bible. Also, everyone should follow customs and traditions with sense. As long as the adopted son might end up with the man's property , she should not bother with adoption . Don't call her. You don't want to be blamed for any decison she needs and doesn't favour her. 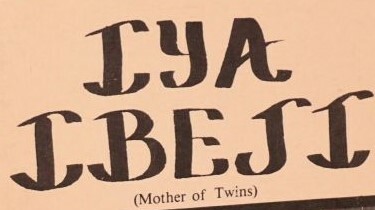 Iya ibeji, the truth is what you actually told her, leave it at that. If she cannot treat the adopted child like she would treat her daughter's then she shouldn't bother.